Over/Under: Over 195.5 at 1.90 Bet Now! Going into Game 4, there was a serious threat that the Cavaliers were going to cause a major upset in the NBA Finals of 2015. Holding a 2-1 lead and playing at home, a 3-1 lead would have left the side from Cleveland on the brink of glory against a team who everyone else was tipping to take the title with ease. As it was, the real Golden State Warriors finally turned up for the NBA Finals, and the comfortable victory tied the series at 2-2 and also gave the Warriors all the momentum. You can’t rule the Cavs out just yet, they are a team with great physical and mental strength but the comprehensive manner of victory for the Warriors in Game 4 should give them great confidence and impetus to achieve success in the next couple of games. The home record of the Warriors at the Oracle Arena is one reason to back them for success in this game but there is also the fact that the Cavaliers have a number of big injuries to key players. Kevin Love and Kyrie Irving are both struggling big time and in the end, the 82-103 victory for the Warriors in Game 4 was fully deserved. The Cavs may be tired and sore but they know that they have to raise their game in this one or they will be looking at a do or die situation, which you never want to be in when it comes to the Finals. No one particularly wants to see your opponent win the title against you, but you really don’t want the title to be won in front of your fans. This is something that the Cavaliers know could happen if they lose the next two games. However, if the Cavs were to triumph in this game, they know they have a chance for their home crowd to propel them over the line. A slightly flat performance in Game 4 led to LeBron James dropping to an average of 35.8 points while the most recent game allowed Andre Iguodala to shine, and he grabbed 22 points while playing a big role in minimising the work of LeBron. The Cavs may need to drop deeper into their roster to give the team a helping hand but at the moment, you have to think that all of the momentum is riding with the home team going into this game. The Cavaliers arrive with a 67-33 record, which includes a 29-21 record on the road this campaign. In their last 10 games, the Cavs can boast of an 8-2 record, which is slightly better than the 7-3 record held by the Warriors in their last 10 games. Mind you, the 81-20 record held by the Warriors is the most impressive of the entire season so it is not as if any Golden State fans should be feeling jealous or concerned about how the statistics stack up. They may have lost at home in the Finals already but the 47-4 record at home for the Warriors is still hugely impressive. With respect to average points for, the Warriors still have the advantage, 108.7 to 102.5 and for average points against, the Cavaliers lead 97.8 to 99.1. Taking the Warriors at -8.5, at odds of 1.90, is likely to be the decent option as the Golden State team look to utilise that tremendous home record. With respect to the Over/Under market, you should be looking to go OVER 195.5 at odds of 1.90. 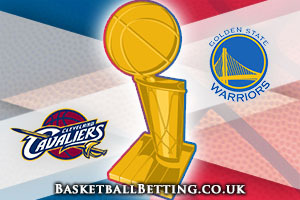 With Money Line odds of 1.23 for the Golden State Warriors, the bookmakers think that the side from California will be able to push on from this point and clinch the title. A home win would go a long way to seeing them complete their dreams. Bet Now!